TOKARA, the magnificent family owned Stellenbosch wine estate, has unlocked the cellar vault to release a special Vintage Collection of the acclaimed Director’s Reserve Red. 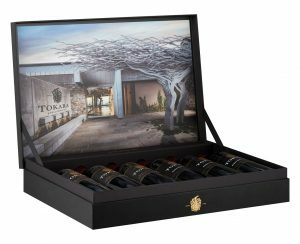 Presented in a stunning presentation case comprising six wines from 2004 to 2009, the TOKARA Vintage Collection is a dream gift for lovers of fine wine. These award winning flagship reds are Cabernet Sauvignon driven blends of four classic Bordeaux varieties from prized vineyards on the slopes of the Simonsberg. Composed of Cabernet Sauvignon, Merlot, Petit Verdot and Cabernet Franc, these sumptuous wines are a true reflection of everything TOKARA stands for – refinement, elegance and balance. The wines in the Vintage Collection stand proud in the TOKARA hall of fame having garnered a slew of accolades over the years. A Double Gold medal at the Tri-Nations Challenge, a Gold medal at the International Wine Challenge and a 94/100 rating in Robert Parker’s Wine Advocate, are just some of the prestigious international awards. On the home front, the wines excelled with among others, two Veritas Double Golds and a Gold at the Michelangelo International Wine Awards. Whether they are kept as part of a prized wine collection, enjoyed one at a time, or shared with wine friends over a vertical tasting of all six vintages, these wines are sure to create lasting memories this festive season. The TOKARA Vintage Collection is available exclusively at selected Makro stores at their special price of R3 999 for the case of six wines. The Collection can also be purchased at the cellar door upon request. Check online for the latest price. Visit www.tokara.com for more information.